I’ve been subscribing to Food Network Magazine for almost two years now, and I constantly flip through and dog-ear pages of recipes I want to make. And then I get distracted by Pinterest and other wild ideas that pop into my head and I never get around to making these tried-and-true recipes by all of my recipe Food Network chefs. I did make a dish from Guy Fieri for Thanksgiving last year. It had sweet potato, apples, pecans, whiskey glaze. That was freaking delicious. Thank you, Guy! I’m hoping to find another good one in the magazine for this year’s Thanksgiving/Chanukah dinner. Because you guys know they fall on the same day this year, right? The first time it has ever happened, and the last time it ever will. It has to do with the astrological calendar, the way the moon and stars align and all that fun stuff. Regardless, I’m shopping around, looking through all of my foodie magazines for a unique and perfect dish to make for this holiday combo. No luck yet, but I’m keeping my fingers crossed that something amazing pops up. Anyway, I digress. This post has nothing to do with Thanksgiving and everything to do with CANDY CORN! The reason I brought up Food Network Magazine is because I finally got around to making one of the recipes I dog-eared while reading. In last month’s issue, the one and only Pioneer Woman, Ree Drummond, shared a few of her favorite Halloween recipes, one of which was Candy Corn Popcorn Balls. 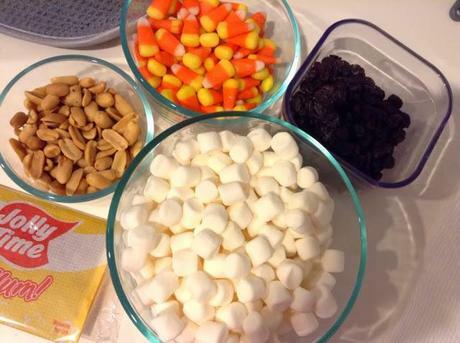 These little balls of popcorn, peanuts, candy corn and marshmallows are so cute and perfect for this time of year. Especially because I have an abundance of candy corn sitting in a pumpkin-shaped glass bowl on the table that my roommates and I randomly pick at. But I decided it’s time to use them for some good old Halloween baking! Ree’s recipe is pretty easy as it is, but I did not feel like popping my own popcorn. Sorry, sometimes I’m lazy. So I just used the kind you stick in the microwave and nuke for a few minutes. I also added in some raisins for another element of texture and sweetness. Very appropriately, it’s also time to bake for the Leftovers Club. Leftover candy corn = Leftovers Club recipe. I missed out on last month’s swap because of another blogger event I was participating in, so I’m happy to be back. I was paired up with Marissa from Pinch and Swirl this time around. Marissa’s a newbie to the club, so welcome! She has some really beautiful photography on her blog, not to mention some killer recipes. She uses a lot of fresh vegetables and herbs and every picture has so many bright, vibrant colors I wish I could eat right off the screen! Her Sweet Potato and Corn Chowder is a must once the Florida heat starts to fade away and it’s soup-making season. I also love the simplicity of this Penne with Slow Roasted Tomatoes, Kale and Mozzarella. And who can resist a good oatmeal cookie? These Oatmeal Chocolate Chip Cookies with Toasted Coconut sound amazing. What a great mix of flavors! 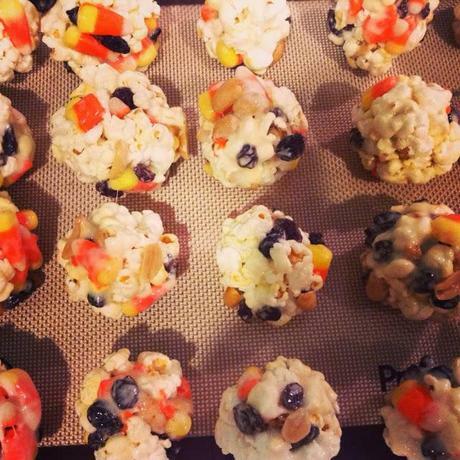 The Candy Corn Popcorn Balls were a hit with my friends, so I hope Marissa enjoys them just as much! It’s a fun and easy snack to make, and you could easily change the ingredients for other holidays. Use pink and red M&Ms in place of the candy corn for Valentine’s Day, Red and green M&Ms for Christmas, or you could even get the blue and white York Peppermint Patty pieces for Chanukah-themed popcorn balls! Oh the possibilities! Pop the popcorn in the microwave according to package instructions. 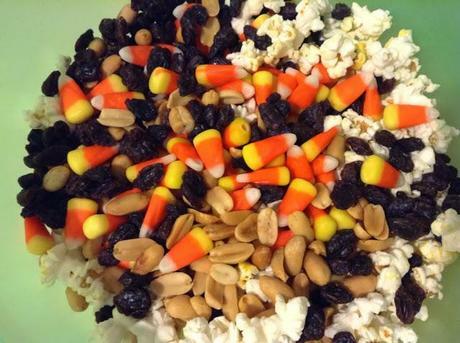 Pour the popcorn into a large bowl and add in the candy corn, peanuts and raisins. Mix well. Melt butter in a large saucepan over high heat. Add the marshmallows, stirring until melted and smooth. Pour the melted marshmallows over the popcorn mixture and toss to coat. Spray your hands with cooking spray and shape the popcorn into 2-3 inch balls. Arrange on a baking sheet to cool. Ready for more #Leftovers from our club? Every month, bloggers are paired up and send each other yummy treats. Check them out here! If you'd like to join in on the Leftover Club fun, go here to sign up!